When you think of famous driving scenes in film, it’s not unusual to recall the biggest, baddest, most explosive car chases in cinematic history. Scenes from The French Connection, Bullitt, 1974’s Gone In 60 Seconds, and really any movie in the Fast & Furious franchise (except 2 Fast 2 Furious, about which the less said the better) often come to mind when listing the best car/driving scenes to populate the big screen. Not every driving scene needs to be explosive to be memorable, though. Sometimes driving scenes are meditative, or funny, or overtly stylish in a way that bolsters the visual aesthetic of a film. Quentin Tarantino is no stranger to these kinds of car scenes (and the more high-octane ones, it should be noted). Need evidence? 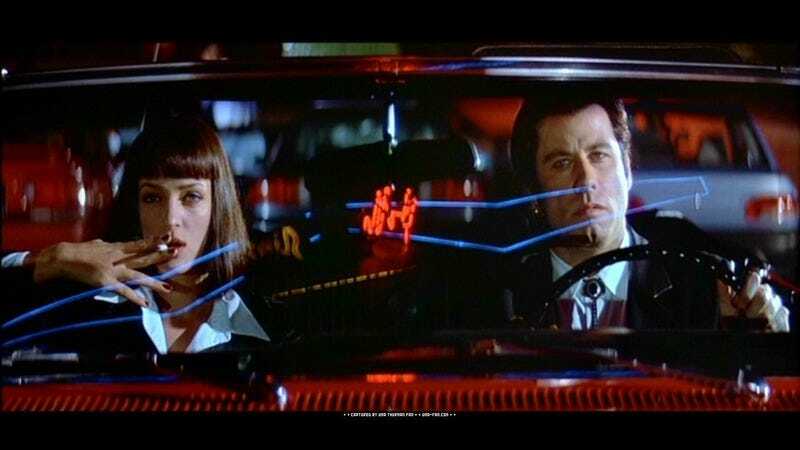 Check out the supercut from Vimeo user Jacob T. Swinney below that looks at all of Tarantino’s iconic car scenes, from Vincent Vega driving around high as a kite, to Beatrix Kiddo musing on how she’s going to catch up with Bill and kill him. Not only does the video show us some of Tarantino’s finest driving compositions, but it also shows how often he reuses those shots, riffing on them or repurposing them for each film—exactly what a good supercut should do.